North-South Expressway Northern Route (E1) - North�South Expressway (NSE) Northern Route, is the northern part of Malaysia's longest expressway, the North�South Expressway. It is situated on the west coast of Peninsular Malaysia, linking the northern states of Kedah, Penang, Perak and Selangor. 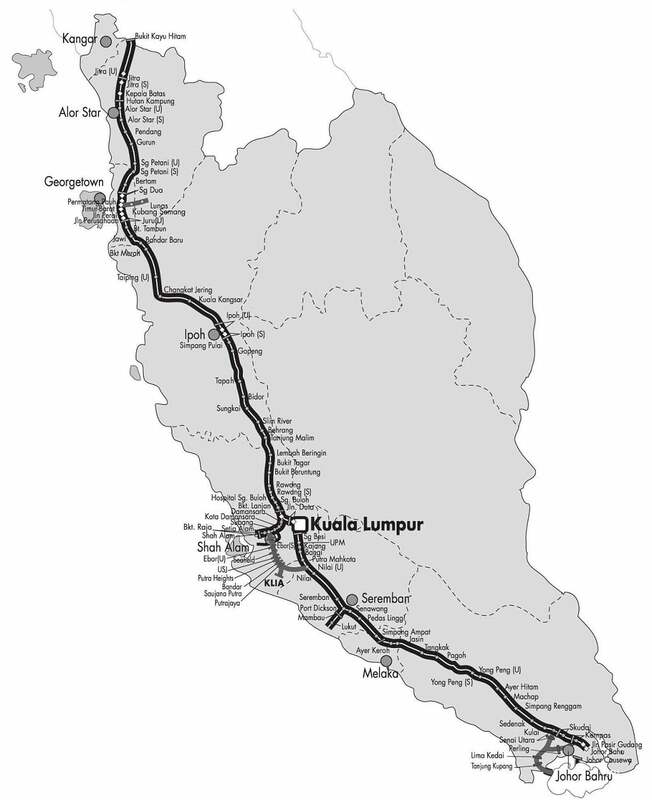 The NSE Northern Route begins at the Malaysian-Thai Border (the town of Bukit Kayu Hitam in Kedah state) in the north, where it connects to the Phetkasem Road in Thailand. Its southern terminus is at the Bukit Lanjan exit in Selangor. North-South Expressway Southern Route (E2) - is the southern part of the North�South Expressway. The expressway is oriented in a north�south direction, traversing four states in Peninsular Malaysia; namely Selangor, Negeri Sembilan, Malacca and Johor. The NSE Southern Route begins in the southern part of Kuala Lumpur, at Sungai Besi. Its southern terminus (Kilometre Zero) is at Pandan, Johor Bahru.The NSE Southern Route begins in the southern part of Kuala Lumpur, at Sungai Besi. Its southern terminus (Kilometre Zero) is at Pandan, Johor Bahru.